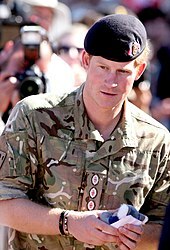 ^ "Afghan Taliban threaten to kidnap and kill Prince Harry". Reuters. 10 September 2012. Retrieved 21 August 2018. ^ James, William. 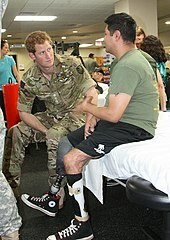 "Prince Harry promises to listen as he starts new Commonwealth job". U.K. Retrieved 6 July 2018. 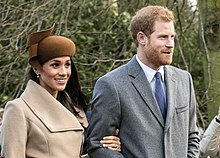 ^ "Meghan Markle Made a Surprise Appearance With Prince Harry". Time. Retrieved 8 April 2019. ^ "Prince Harry surprises crowd, brings Duchess Meghan on stage for WE Day appearance". USA TODAY. Retrieved 8 April 2019. ^ Robinson, Matthew; Respers France, Lisa (10 April 2019). "Prince Harry and Oprah are making a documentary series about mental health for Apple". CNN. Retrieved 10 April 2019. ^ Ward, Victoria (22 May 2018). "Nottingham Cottage: The Kensington home where Meghan and Harry live as a married couple". The Telegraph. Retrieved 12 July 2018. 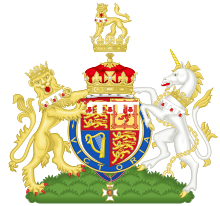 ^ "Meghan and Harry: Duchess of Sussex expecting a baby". BBC News. 15 October 2018. Retrieved 15 October 2018.